Mike Woodman hold the pin as hundreds of balls drop toward the hole. Volunteers load the ball bucket. Ray Wyban, John Zick, Louie Pow and Lou Beckwith pose for a photo before teeing off. Volunteers Carol May, left, and Debbie Leist drive the beverage cart. Mike Damato the winning ball that was worth $2,000. Joe Deschenes purchases some balls as Linda Tyler checks him in. Bob Mcalister watches his ball drop into the hole for a double eagle on the seventh hole at the White Marsh course. Looking on are, from left, Billy Joe Griffin, Pete Antash and Joe Sheedy. Golfers leave to their perspective tees at the start of the tournament. Dennis Cook, left, and Bill Vanderbilt await the start of the tournament. Lots of local businesses supported the tournament with sponsorships. Who's got the lucky ball? 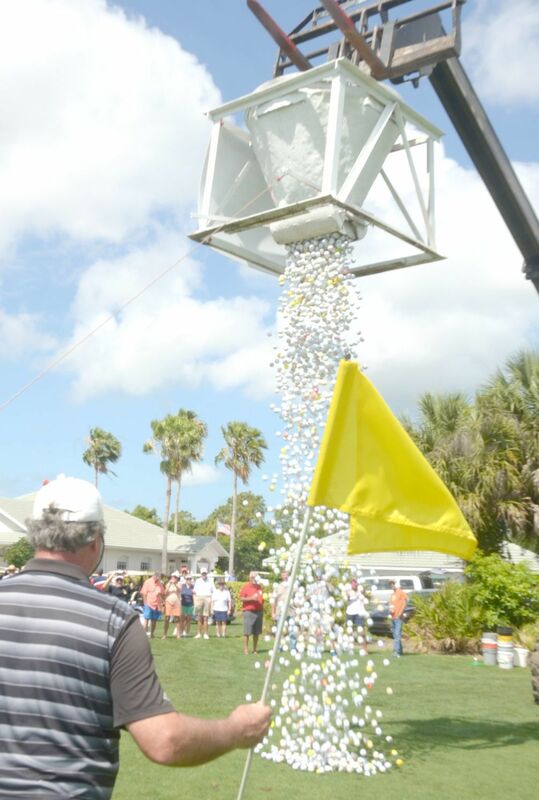 American Legion Post 113’s 17th annual Charity Golf Tournament and Ball Drop was another success for the Rotonda post. The scramble tournament and ball drop chance drawing were held Saturday at Rotonda Longmarsh Golf Course. The event drew 220 teams of golfers. Proceeds benefit Post 113 Welfare Fund and Fish’n For Heroes, a local nonprofit that takes wounded veterans on free charter fishing trips. For more information about the post, visit alp113.com or call 941-697-3616.